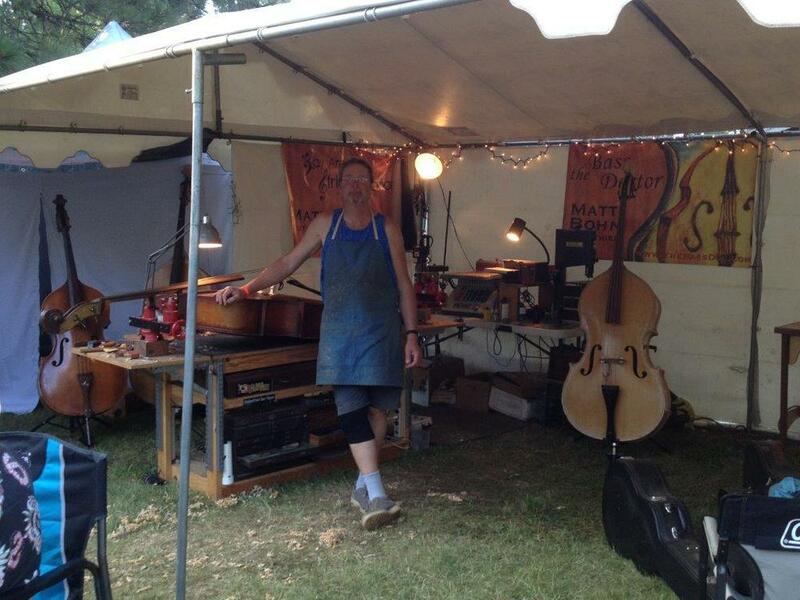 After 25 years manning The Luthiers Tent, spring and Fall at The Strawberry Music Festival, www.strawberrymusic.com Michael Lewis has officially retired from his service there and has asked me to take over. I invited Rick Turner www.rickturnerguitars.com to help me out. Rick takes care of all of the fretted instrument work that comes in and I take care of all of the violin/fiddle, basses and yes, some cellos too that are in need of repair or set up work. We’re there for the Spring and Fall festivals! We load as much hand and power tools as we can carry, so we’re ready for just about anything! I’m able to perform full set-ups including new bridge installation with adjusters for bass. I am also able to perform most repairs with the exception of top off repairs. I will also have my re-hairing jig with me and top quality Mongolian horse hair in white or black. I’ll try to have whatever violin family accessories that Dana Thorin, www.musiccaravan.com, next door at The Music Store may not, such as: bows, fiddles, rosin, strings, pick ups and bass wheels. If you have a special order/installation request or inquiry as to something you’d like me to help you with while I’m there, please don’t hesitate to email or call. I am honored and humbled to be joining some of the most well known Luthiers in the country at The California Bluegrass Association’s Fathers Day Festival www.cbaontheweb.org/ My focus will be upright bass only for this event at the indoor Luthier’s Pavillion. I’ll be equipped to help bassist of all levels with anything involving set-up, accessories, gluing, and evaluations. I often take instruments with greater issues than I can deal with onsite, home with me to the shop where I’m better able to make repairs that are more involved, i.e. top off/neck reset. I will also be prepared to re-hair, straighten, re-camber or French polish your bow. I’ll have premium black and white, mare and stallion Mongolian horse hair on hand.